Entergy was billed $55,000 for an astroturfing campaign that involved paying people to show up at meetings to support building a gas-fired plant in Eastern New Orleans. 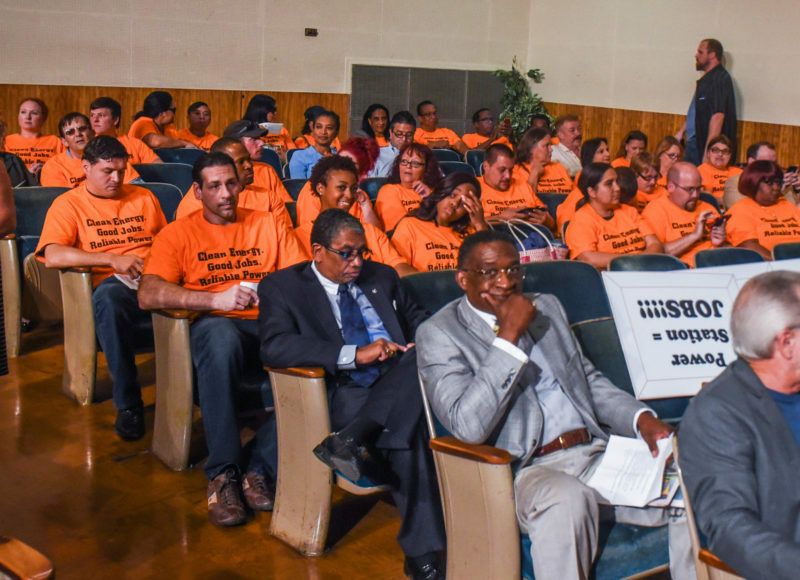 In October, a reporter for The Lens observed a group of about 50 people walk into a public hearing wearing orange shirts supporting a new power plant in New Orleans. Some of them were actors, according to interviews and messages reviewed by The Lens. Entergy says it hired a PR firm to bring supporters, but it didn’t know those people were paid. Entergy New Orleans was billed about $55,000 to bring people — including actors — to public meetings to show support for a new power plant, according to documents turned over to the city council as part of its investigation into the astroturfing campaign. But that was a lot less than the half-million dollars proposed by a public-relations firm to create a group to advocate for the plant, complete with local leaders drawn from the business and political establishment. Entergy never moved forward with that plan. Those are some of the details buried in hundreds of pages of documents turned over by Entergy to the city council Friday and provided Wednesday to The Lens. The council opened the investigation a few weeks after The Lens revealed that dozens of people, including actors, were paid to attend public meetings and deliver pre-written speeches in favor of the power plant in eastern New Orleans. Participants got $60 to attend each meeting, wearing bright orange shirts that said, “Clean Energy. Good Jobs. Reliable Power.” Those with “speaking roles” were paid $200. Entergy has acknowledged paying the Virginia-based Hawthorn Group to bring supporters to the meetings, but the power company said it didn’t know those people would be paid. Hawthorn, in turn, hired Crowds on Demand, a Los Angeles-based company that pays people to show up at events such as protests and government meetings. Some of the documents provided to the council raise questions about what Entergy knew about the arrangement. “What’s your take on union leaders also wearing orange t-shirts, similar to the attendees you’re securing?” Entergy’s communications manager asked the president of Hawthorn as they prepared for a city council hearing in October. Entergy New Orleans CEO Charles Rice Jr. played a significant role in hiring Hawthorn to bring out supporters. Bright Moments, a public relations firm, was paid by Entergy to monitor meetings of groups opposed to the power plant. Discussions between Entergy and Hawthorn included everything from the design of T-shirts to the exact time that supporters would arrive at meeting locations. The council approved the gas-powered plant on March 8 in a 6-1 vote. A coalition of environmental groups has since filed lawsuits against the city demanding that the council reconsider the matter, in part because people were paid to support the plant. The council plans to hire an independent firm to investigate what happened. And the council has introduced new cards requiring anyone who speaks at a meeting to disclose whether they had received any compensation, including cash, meals or transportation. Entergy and Hawthorn were already shaping an advocacy campaign by mid-August. By the end of the month, Hawthorn presented a proposal for a sprawling advocacy campaign that would cost Entergy between $417,000 and $663,000 over six months. Hammelman proposed a “GrassTops” organization, made up of “respected New Orleans civic, labor, religious, minority and community leaders” that would advocate for the new power plant, solicit support from associates, write columns to local media, and contact public officials. Among the names floated in her proposal for inclusion in GrassTops: Gary LaGrange, president of the Port Authority Association; Noah Lewis of 100 Black Men of Metro New Orleans; Andy Kopplin, who was second-in-command for the Landrieu administration and now heads the Greater New Orleans Foundation; state Sen. J.P. Morrell; AFL-CIO president Tiger Hammond; and real estate developer Joe Jaeger. Hammelman said the company hadn’t reached out to those people, so she didn’t know if they would be interested. Ultimately, Entergy opted against that massive effort. Hammelman came back in September with a relatively modest proposal to bring supporters to an upcoming public hearing regarding the power plant. This is one of the messages a recruiter posted to his Facebook page advertising the gig. Even if Entergy officials didn’t know people would get cash to attend the meetings, the company was willing to pay a sizable sum to get them there. On top of that, Hawthorn wanted a $7,500 service fee. Entergy decided to hire Hawthorn to help with the meeting in October and another in February. Hawthorn was to bring 75 supporters, plus 10 speakers, to the October meeting and 30 supporters, plus 10 speakers, to the one in February. Opponents of the plant have complained that they were shut out of meetings and denied the ability to speak. Minutes before the October meeting began, the council chamber was a sea of orange. Crowds on Demand arranged the T-shirts, paying $4,500 for 250 of them. “I think we’ve got them outnumbered,” Rice chuckled to one of his colleagues. 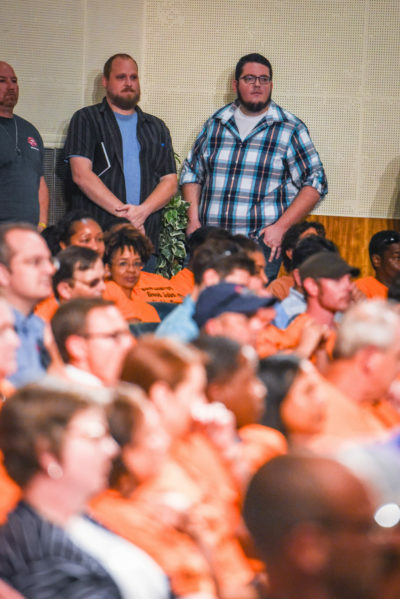 Behind a sea of orange shirts at a public hearing in October stood two men who had recruited people to support and speak on behalf of the power plant: Garrett Wilkerson, left, and Daniel Taylor, right. Documents turned over by Entergy to the city council confirm that the two men worked for a company called Crowds on Demand, which provides people to show up at protests, government meetings and other events. 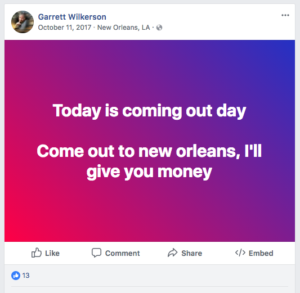 They were referring to Garrett Wilkerson, one of the organizers of the astroturfing campaign. “Tell nobody you’re being paid,” he had instructed one of the recruits in a Facebook message. Other Facebook messages reviewed by The Lens asked recruits to sign a non-disclosure agreement and told them how much they’d be paid, what to say and where to meet before and after the meeting. Documents provided to the council confirm that Wilkerson and another organizer, Daniel Taylor, worked for Crowds on Demand. The Lens interviewed three actors, including one who agreed to be identified, who appeared at the October meeting. One of them said he recognized 10 to 15 people from the local film industry. Keith Keough, one of the men who spoke to The Lens, said the group was paid to clap anytime someone denigrated renewable energy such as wind and hydropower. Entergy paid Hawthorn $32,142.11 for this meeting. Hawthorn was back at work in February. The evening before that meeting, Gary Huntley, Entergy’s head of regulatory and governmental affairs, emailed Rice and other Entergy employees. “I received confirmation that the room will open at 8:30 am. Let’s get as many of our folks there ahead of the bus from NO East,” he wrote. That message was forwarded to Hammelman, who had arranged supporters to arrive by 8 a.m.
Hawthorn billed Entergy $22,478.40 for the February meeting. But the contract wasn’t amended to include the second meeting until late April — about a week before the astroturfing campaign became public — and that invoice was never paid. Hawthorn refunded its fee to Entergy, and the power company has said it would donate it to charity. Hawthorn has a history of astroturf lobbying — using money to create the illusion of grassroots support. In 2009, a contractor for Hawthorn sent letters purporting to be from minority and senior groups opposing clean energy legislation, according to several publications including The New York Times and Politico. 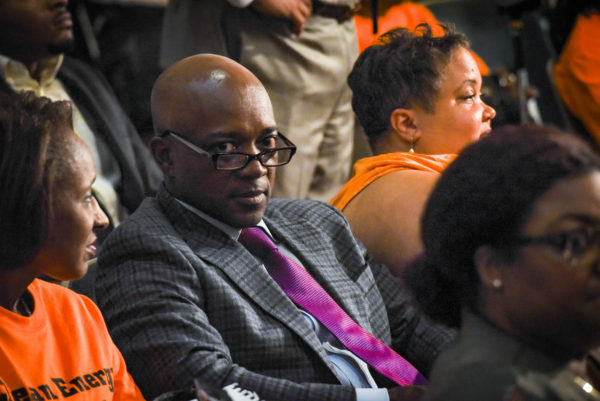 At an October public hearing, Charles Rice Jr., CEO of Entergy New Orleans, sat next to people wearing orange shirts supporting the power plant. Some of the people who wore shirts to the meeting and spoke in support the plant were paid to do so. Entergy, too, has said it didn’t know. However, the documents raise questions about whether it was really in the dark. Pollard did not respond to a request for comment. In March, Entergy officials heard that opponents were accusing the company of paying supporters to show up. In an email, Pollard told Hammelman that an opponent was claiming people had been paid $60 to show up at a meeting, they had signed non-disclosure agreements, and they were paid at a Dave and Buster’s. Later that evening, she sent a list of talking points in case the alleged payments were brought up at a Utility Committee meeting the next morning. Lens reporters Marta Jewson and Charles Maldonado contributed to this story.